Behold & Reflect: Asking Myself: "What is written in the law?" Asking Myself: "What is written in the law?" This is the 17th post in my series "Asking Myself," in which I weekly ponder one question posed in Teresa Blythe's rich book, 50 Ways to Pray. You can find the start of the series here and last week's post here. The first nine posts focused on theological musings, while posts 10 to the present prayerfully consider the specific questions Jesus posed in the New Testament. Q: What is written in the law? I'm going to come at this one in a round-about way. My reflections on this question stem from reading my journals from 20+ years ago. As a newly "serious" believer, somewhere during my sophomore year in high school, it seemed there were so many laws in the bible and in my church group, both spoken and unspoken, written and unwritten. For one, I felt certain God wanted me to share my faith by inviting everyone I knew to my church. Another biggie: I thought I needed to excise all worldliness from my habits, hobbies, disposition, career pursuits and thought life. Worldliness, I thought at the time, included most TV, movies and music, as well as many academic disciplines that delved too deeply into the soul, most of the fine arts (classical music was OK). Worldliness was even lurking in too much thinking... something I was guilty of 99 percent of my waking hours, but couldn't seem to shake, because trying typically required thinking. The result of my interpretation of "what was written"? I judged myself harshly. I judged those around me even more harshly. I don't think of myself as a judgmental person, but a 180-page Mead notebook crammed full of crazy thoughts fresh baked from the brain of teenaged Emily proves otherwise. Those early entries show I began reading my bible through the filter of my particular church culture and Christian individuals from whom I sought counsel, much of it spot on. But some of the counsel led me a little ways off the essentials and into a forest of peripherals. And there I wandered in arrogant, self-defeating circles, like the children of Israel in the desert. There, in the wilderness, it seemed the bible should be— surely it must be full of certain, specific instructions, a "road map" on avoiding worldliness, fleeing youthful lusts and pursuing holiness. It must be able to tell me how to do the right things so that I'm on God's good side... and though I would not have admitted it at the time, so that He gives me the things I want. I wasn't in a place of testing Jesus, like the lawyer in Luke 10, I genuinely wanted to know what I needed to do to provoke Jesus into satisfying me with find eternal life. What must I do to get eternal life? 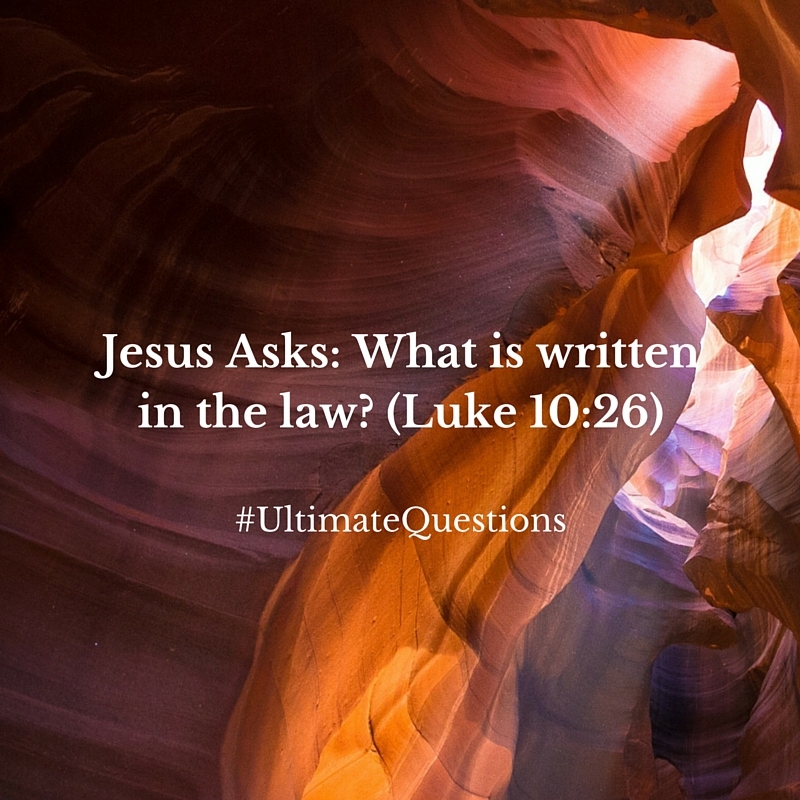 "What is written in the law? How do you read it?" I think it's so great that Jesus asked the lawyer to draw from his knowledge and expertise and interpret the law. The lawyer was up for the task. And he answered and said, "You shall love the Lord your God from your whole heart and with your whole soul and with your whole strength and with your whole mind, and your neighbor as yourself." It's a little funny to me that like the lawyer, my 16-year-old mind glossed over the loving God with my whole being part of the answer and honed in on the particulars of "who exactly is my neighbor?" 38-year-old me gets new inspiration from the main part of the Golden Rule, the Greatest Commandment. I no longer worry about being too soulish, because exercising my whole soul is part of my loving God. I don't have to prevent my mind from rambling because it must think in order to be wholly set on loving God. This episode in Luke 10 offers no clear step-by-step prayer to get into heaven or task list to be an overcomer in the New Jerusalem. But someone who was expert in the bible's laws could see a clear, succinct theme. A theme Jesus affirmed as "correct." Granted, it's a command to do something that goes against every fiber of our being, every wind of our culture, every trend of society: Love others. As ourselves. Love with our heart, our soul, our strength, our mind. The whole thing. Jesus answers questions with questions or with stories because he wants his seekers to dig up the truth that was imprinted on their DNA. If he gives a straight answer, we're so at risk of just being satisfied with having the right answer and no longer feeling concerned about actually living that truth in obedience. We won't continue seeking, which in my mind, is a big part of how we love with our whole being. Love is ascribing worth to another at a cost to yourself. Judgment is ascribing worth to yourself at a cost to others. It seems so clear now. But perhaps, like the law scholar in Luke, who gives all Christians everywhere an "Aha!" moment with his pithy 2-part summary of the bible, I still wouldn't have gotten it. And 48-year-old me might look back and pity this 30-something blogger with blinders. One thing my good friend Christy often says that encourages me: "The Lord knows, if we're nothing else, our hearts are earnest in seeking Him." Lord knows we are earnestly trying to love Him. Sixteen-year-old Emily was earnest. She wanted to do the right thing and she wanted to please God and know Jesus in the power of his resurrection. She wanted her love to abound yet more and more in full knowledge. She had no clue what any of this looked like. But she was earnest. So she's going to love others as herself. As though they are earnestly seeking God, despite their filters and blinders and experience-shaped perception of what is written in the law, or what isn't. Jesus Asks: Who do you say that I am? Jesus Asks: Why were you searching for Me?